For the sparkliest crafting projects you can imagine, our Glitter Shakers x 5 are a compact and easily stored resource. 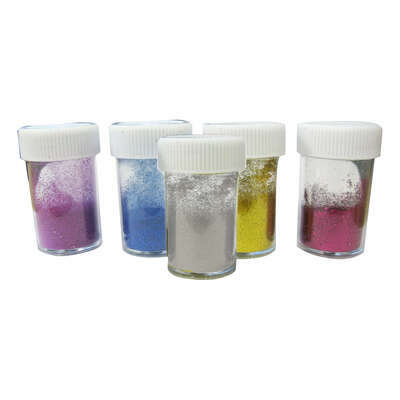 Suitable for all ages from primary school right up to older artists, this set of 5 glitters are provided in a range of metallic colours and come in a loose glitter design. Perfect for decorating collages, paintings or even 3-dimensional crafts, simply sprinkle over glue or paints to create a twinkling display that is sure to delight. As part of our Classroom and Nursery range, this pack provides great value for busy educational environments and comes in screw-lid pots that can be securely stored with the rest of your Arts and Crafts collection until needed. Take the stress out of messy crafting sessions and, instead, opt for our Glitter Glue Pens 10pk - provided with glue mixed in to prevent the wayward scattering of sparkle around your classroom.